InnLay Fisherman, originally uploaded by ZackTwin. 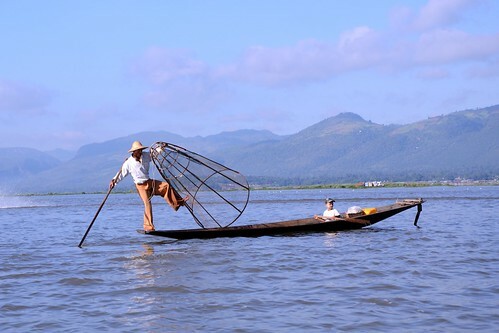 In Inle (or InnLay) Lake, fishermen row their boats using leg while standing on the stern. In this photo, the fisherman is dropping the cone shaped net into the water. Later he will use a long sharp spear to drive fish into the net. I took this photo when we are crossing the lake in the early morning on the way back to NyaungShwe.